Stay and Play on our magnificent shores of Daytona Beach. Oceanfront rooms featuring two queen size mini refrigerator microwave coffee maker and balcony oceanfront efficiencies featuring two queen size beds or one king size bed kitchen dining table and balcony. Oceanfront suites featuring 2 queen size beds in the bedroom kitchen living room with sleeper sofa and balcony. 2 oceanfront swimming pools one heated kiddie pool direct beach access basketball beach volleyball shuffleboard BBQ grills laundry facilities Lobby computer 24 hour guest service Complimentary Wi-Fi Complimentary parking Complimentary continental breakfast. Aunt Catfish: Aunt Catfishs provides a southern seafood tradition. Down South River Cookin by natives that you definitely dont want to miss! Thick and meaty clam chowder fresh catches prepared with a southern twist and you can't forget those delicious sticky buns. Down The Hatch: Down the Hatch offers Florida dining overlooking the scenic waters of Ponce de Leon Inlet. The menu includes soups salads and sandwiches along with seafood steak chicken pork and pasta dinners. Come and dine inside or outside on the deck. Mai Tai Bar: The Mai Tai is tucked away in Ocean Walk Shoppes overlooking the historic Band shell and featuring a spectacular view of the Atlantic Ocean. The Mai Tai bar features one of Floridas best happy hours and the coolest live music on the coast. Ho Heaven Bar-B-Q: Hog Heaven brings the country to the beachside. You will find country-friendly family-style smoked-ribs-and-pulled pork kind of eatery right smack-dab in the middle of Daytona Beach. They are waiting for you at Hog Heaven. Directly on the Worlds Most Famous American Beach Daytona Beach. Shopping center and mini golf located across the street. Close by Daytona Beach Pier Ocean Center Convention Center Daytona International Airport Newly renovated Daytona International Speedway. Angel and Phelps Chocolate FactoryThis fascinating chocolate factory is known for high quality handmade chocolates made fresh every day. Take a free guided 20-minute tour through the chocolate-making process and learn what makes their chocolate creations so good. Daytona International SpeedwayThis Daytona Beach landmark and home to the world-famous Daytona 500 is open to the public every day. Start with a birds-eye view of the track and the 31-degree high banked turns from the grandstand area. Daytona LagoonExciting speed slides and attentive guards 12 water rides a giant wave pool and lazy river fast-paced 4-lane racer slide. The family center includes go-kart racing mini golf laser tag rock wall island hopper and LARGEST arcade in Daytona. 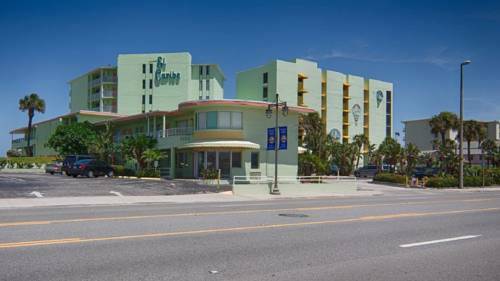 Historic Beach Street Shopping and DiningDowntown Daytona Beachs Riverfront Shops of Daytona Beach boasts more than 60 shops restaurants attractions and services plus our exceptional Farmers Market-all in a splendid waterfront setting. Jackie Robinson StadiumRelive history in this minor league baseball park where Jackie Robinson played in the first integrated Major League Baseball spring training game in 1946. The ballpark features a statue of Robinson historical markers and a museum. Marine Science CenterExplore conservation themes and witness current rehabilitation efforts for live sea turtles and seabirds explore fascinating mangrove and whale exhibits and meet the residents of a huge artificial reef aquarium. Museum of Arts and ScienceThe areas largest museum offers vast permanent collections a planetarium and the only hands on science center around. The Childrens Museum houses professionally designed interactive exhibits that demonstrate various principles of science. Ocean CenterDaytona Beachs multi-purpose convention center and entertainment complex hosts numerous concerts and performances throughout the year. Call for a schedule. Peabody AuditoriumThis historic facility plays host to the Daytona Beach Symphony Society Daytona Beach Civic Ballet and a host of live concerts and theater performances. Peabody hosts the Broadway in Daytona Beach series each year. Ponce Inlet Lighthouse and MuseumCompleted in 1887 and the tallest lighthouse in Florida stretches 175 feet into the sky. The surrounding grounds feature historical and nautical museum featuring a Fresnel Lens exhibit artifacts on lighthouse life shipwrecks a gift shop and more.